This is the only species of mound-forming wood ant present in Northern Ireland and it is restricted to a single site. The large nest mounds are an impressive sight, up to a metre in height and home to thousands of workers. As the species is restricted to just one site, there is a high risk of extinction for natural reasons. This is a large red and black ant up to 10mm in length. The thorax and the underside of the head are red, the top of the head and abdomen are black. Ants, like the bumblebees and wasps, are social insects; they live in colonies which can persist for many generations. Colonies comprise large numbers of non-reproductive females with one or more queens, which are the only breeding individuals. In the Scottish wood ant, each colony typically contains many queen ants and thousands of workers and lives in one or more nest mounds. Male ants and new queens are produced in early summer and mating flights occur in July. New mounds may be created by groups of queens and workers from an established mound. The worker ants forage widely from the nest and are said to feed mainly on honeydew, the sticky, sweet secretion of sap-sucking aphids. Formica ants are the largest ants in Ireland, much bigger than the red ants found commonly in gardens. 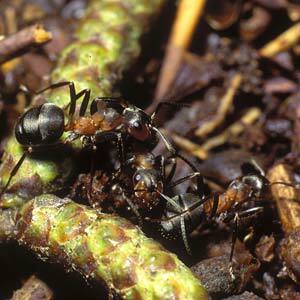 The only other Formica species in the region are all black and do not construct mound nests. A second closely-related species, Formica lugubris, is found in a few areas in southern Ireland, mainly Tipperary. Separation of the two species can only be done on microscopic characters. The nest mounds can easily be seen in Annaghgarriff Wood at Peatlands Park; several exist close to the main path through the wood. They consist of piles of leaves and vegetation up to 1m on height. Workers can be seen on the surface of the nest from February right through to November depending on the weather. On mild days in late winter and early spring, groups of ants have been observed, huddled together in patches of sunlight on the surface of the nest. Worker ants can also be seen moving to and from the mound on trails as they forage for food. The Scottish wood ant has the most restricted distribution of any ant in Ireland, limited to this single population. The nest mounds are only found in the woodland at Peatlands Park. The conspicuous nature of the mounds means it is unlikely that there are any overlooked populations. 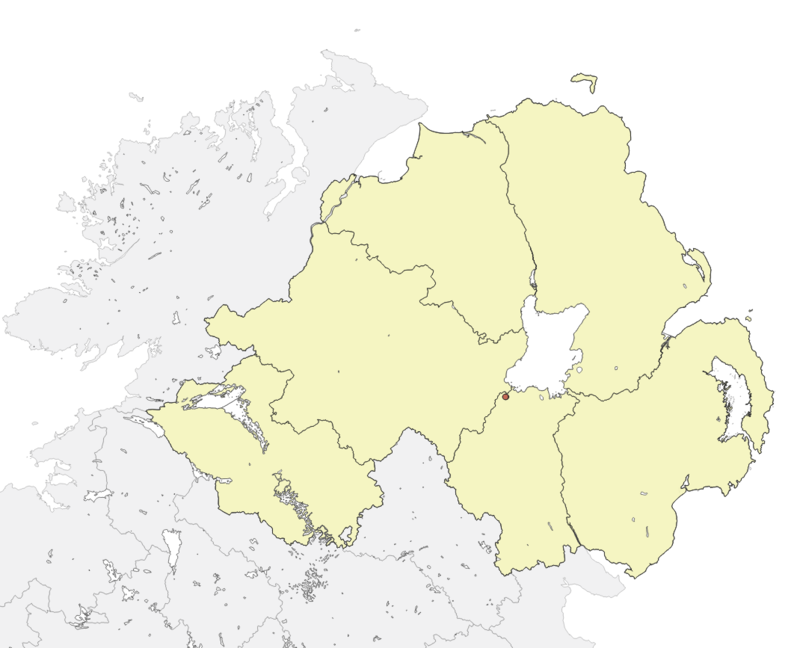 It is rare in Northern Ireland, confined to a single population, which is the only one in the whole of Ireland. As the species is restricted to just one site, there is a high risk of extinction for natural reasons; however, the ants are known to have been here for at least 100 years. Studies in Finland indicate that the main factors in determining distribution are the availability of suitable nest sites, a favourable microclimate, and a good food supply. Sap-feeding bugs are especially important, both as prey and for the honeydew that they produce. It has been estimated that 90 per cent of foraging activity by the ants is in the canopy of trees near the nest. There is a UK Species Action Plan which was published in 1999. Implementation of the Northern Ireland habitat action plans for Mixed Ashwoods and Oakwoods. Promote opportunities for the appreciation of the Scottish wood ant and the conservation issues associated with its habitats. If you see the species away from Peatlands Park, report any sightings to CEDaR, National Museums Northern Ireland, 153 Bangor Road, Cultra, Co. Down, BT18 0EU, Tel: 028 9039 5256, cedar.info [at] nmni.com or to the Bees, Wasps and Ants Recording Scheme (BWARS) who organise the recording of ants in Britain and Ireland. Skinner, G. J. and Allen, G.W. (1996). Ants. Naturalists’ Handbooks 24, Richmond Publishing Co. Ltd.